Homemade Cookies published by the editors of Farm Journal in 1971 is a hard cover compilation of over 460 cookie recipes that were the best cookie recipes published in Farm Journal over the previous 20 years plus recipes from their test kitchens. And there is the reason it’s an excellent recipe book…test kitchens. These recipes all work! It contains every old favorite that Mom or Grandma may have made, sorted out by types of cookies. If you want a bar cookie, drop cookie, rolled cookie, pressed cookie, homemade cookie mixes, cookies to make with the kids, it’s in there! One of the more unusual chapters contains recipes they developed for small cookies that tasted like pies - called pie-bars. Have your pie and not feel guilty! What could be better than that? When I was newly married, you could order these Farm Journal cook books from an order sheet…I think I have most of them from around that period. The best, like this book, are edited by Nell B. Nichols. Later cook books are not quite as good. You can still get them at used book stores, book sales and online - I saw this one at a recent book sale for $2.99. Farm Journal had such a large file of recipes they seldom published the same ones in different books. Check this post for some ideas on cookie baking equipment. 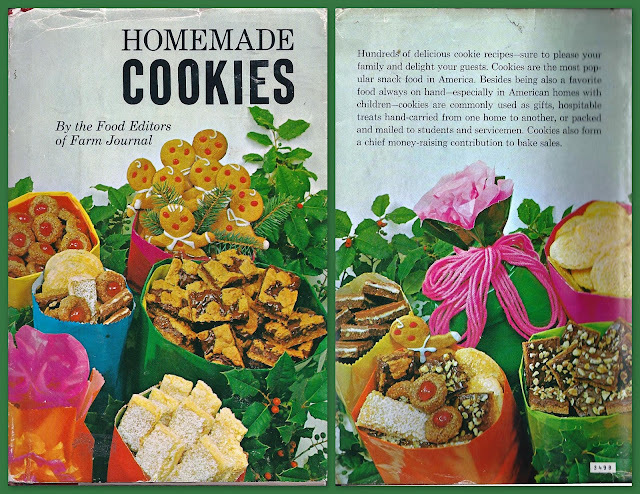 Try some recipes from this book to give you some ideas for holiday cookie trays. I adore this book! Like you said, the cookies are all so good. Many of them are good for you, too, with lots of raisins, other fruit, whole grains, and spices. I want to try making so many of them, but I just don't have the time. I do spend a few minutes, here and there, indexing it on the Cookbooker Web site, which feels good, because I'd love if there was more interest in this 40+-year old book. I used this book so much that it fell apart. I am searching for a recipe from that book...it was near the back in the section "baking with children" or something to that effect....I think the name was Candy Bar cookie and it mentioned that it was a 4H recipe. There was a baked oatmeal base with chocolate chips and peanut butter melted on the top. I have been looking for the recipe with no luck....if someone could find it and email me with the recipe, I would be forever in your debt. My adult children have been clammoring for those cookies! Is this the recipe you are looking for? Combine all ingredients, except chocolate pieces and peanut butter. Spread or press into greased 13-in. x 9-in. pan. Bake in moderate oven (375') 15 to 20 minutes, or until light golden brown. Meanwhile, melt together chocolate pieces and peanut butter over hot water. Spread over baked cookie while warm. Cool slightly in pan set on rack; then cut in 3-in. x 1-in. bars. Description: "Chewy, toffee-like bars topped with tasty peanut-chocolate." I have lost my copy. Can you tell me where I can order one? I think someone 'borrowed😑' it. Once in awhile you can find them at book sales or thrift stores. Hope this helps.